"Play Up" has been the motto of the Western Athletic Conference the past few years. The Hawaii women's volleyball team has revised it to: "Don't Play Down." It's not that the Rainbow Wahine are overconfident when it comes to facing WAC teams, although with a 171-3 regular-season conference record, they might have reason to. What Hawaii wants to do when opening up its 13th WAC campaign tomorrow night is to maintain the playing level that led to Saturday's victory over then-No. 9 Washington. And build up from that. The first test is Idaho, coming in with one of its best teams in the program's history. The Vandals (7-4) have only played one ranked team - opening at current No. 14 Middle Tennessee State, the team that ended Hawaii's season last December. "Teams like Pacific weren't ranked either and they gave us a run for the money," Wahine senior middle Nickie Thomas said. "They played well, picked apart some of the things we do. They played well and it shows, ranked or not, you can have a good team. "Mentally, we can't play down against anyone. Saturday we played really, really well against Washington and now we know how good we can be. Now we need to do that consistently, show we deserve to be No. 7. Because we do deserve to be No. 7." And when it comes to Western Athletic Conference competition, don't let up. No. 7 Hawaii finished its preseason on a very high note, outlasting then-No. 9 Washington in five last Saturday. But after playing one of the toughest nonconference schedules in the country, the Rainbow Wahine (7-2) look to maintain their high level of play when they come back down to the WAC, which was ranked an all-time low 16th in RPI last season. "It is a change, not playing teams as good as the ones we have been playing," senior hitter Jamie Houston said yesterday. "It is a mental thing and we have to not play down. As long as we do what we have to do when the pressure is on, we'll be the top team we want to be. "If we want to be playing in Nebraska in December (for the NCAA championship), we can't make mental errors." Jamie Houston and her Wahine teammates hope to soar above the Western Athletic Conference for the 13th straight season. UH meets Idaho tomorrow. Tomorrow's WAC opener against Idaho gives Hawaii plenty to think about. The Vandals feature one of the top players in the conference in senior hitter Haley Larsen, who leads the WAC in kills (4.46 kps). "Idaho is very good," UH associate coach Mike Sealy said. "Their whole team is playing well, taking good swings at the ball. "They're just a good fundamental volleyball team. We're going to have to earn our points." Head coach Dave Shoji anticipates that the conference teams will be improved overall. "The WAC has the potential to be better," he said. "I think everyone has stepped up their preseason schedule. We have to pay attention to every team. "You can feel good about the win (over Washington) but you can't rest on that. We have to continue to practice hard and get better." 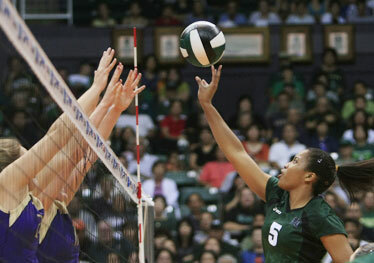 The seventh-ranked Wahine roll into WAC play on a six-match winning streak and are coming off a huge win over then-No. 9 Washington on Saturday. It was the first win over a top-10 program since 2006 when UH upset USC in a regional semifinal. Senior hitter Houston, the Most Outstanding Player of the Chevron Invitational, had a season-high 27 kills against the Huskies to get her average up to 3.89 kps, second best in the WAC. Hawaii leads the conference in three team categories: hitting percentage (.288), assists (13.73 aps) and kills (14.59 kps) Two Wahine lead individual categories: senior middle Nickie Thomas in hitting percentage (.421) and junior middle Amber Kaufman in aces (19); Kaufman broke the school record for aces with 11 against Washington. Freshman hitter Kanani Herring has been nothing short of spectacular, ranking fifth in the WAC in scoring (kills, blocks and aces). She had her first reception error of the season against UW after 98 perfect serve-receives. The Aggies have nearly matched Hawaii's tough preseason schedule, with trips to the Illinois and Stanford tournaments. Among their losses are No. 11 Oregon, No. 4 Texas and No. 7 Stanford. New Mexico State snapped a four-match slide last Saturday with a 3-1 win over UC Santa Barbara. The Aggies head into conference play with a losing record for the first time in seven years. Senior middle Amber Simpson (1.38 bpg) has 473 blocks and needs just 23 to break the 16-year-old NMSU career record. Back are four other starters, including senior libero Krystal Torres and junior hitter Krista Altermatt. The Vandals' modest winning streak ended at two when they fell to host Gonzaga 25-23, 13-25, 25-19, 21-25, 15-11 last night in Spokane. Last weekend, Idaho went 2-2 at the Portland State Showcase, including a 3-2 win over the host Vikings, the first home loss in 21 matches for PSU. Junior middle Anna McKinney had 13 block assists against Portland State, the most for a Vandal since 2003. Senior hitter Haley Larson leads the WAC in kills (4.46). Idaho tops the conference in digs (16.24), led by junior libero Kelsey Yonker (4.43 dps) and in aces (55). The Spartans went 2-1 at the Loyola Marymount Classic, defeating UC Irvine and Pitt, and falling to the host Lions. San Jose State's kill leaders are senior hitters Kelly Crow (.3.18 kps) and Niki Clement (2.95 kps). Junior libero Kristal Tsukano (Kamehameha '06) averages 3.21 dps and sophomore hitter Brianna Amian (Moanalua '07) averages 2.24 kps. The Aggies' first win of the year was a big one when they outlasted then-No. 15 Purdue in five. Their second came Tuesday in a sweep of Utah Valley, which visits Hawaii Nov. 15. Utah State returns five starters from the team that stunned the Wahine in the final regular-season match for both teams. Leading the Aggies are senior hitter Melissa Osterloh (3.62 kps) and sophomore libero Christine Morrill (3.41 dpg). After starting the year 0-2, the Wolf Pack went 2-1 in their AT&T Invitational to even their record. Saturday's loss was to then-No. 24 Pepperdine in three. Sophomore hitter Kylie Harrington (St. Francis '07) is averaging a team-best 3.03 kps. Senior Allison Hernandez has moved from libero to hitter (2.14 kps, 2.86 dps). Freshman setter Tatiana Santiago (Kamehameha '08) has played sparingly in six matches. The Broncos picked up their first two wins last weekend at the InnTower Invitational hosted by Wisconsin, defeating IUPU-Indianapolis and Central Michigan, and losing to No. 23 Brigham Young. The only other ranked team Boise State has faced was then-No. 9 Washington on Sept. 5 in Seattle. The Huskies won 25-11, 25-15, 25-17. Sophomore hitter Alisa King (2.44 kps, .91 bps) and sophomore middle Sadie Maughan (2.33 kps, .305, .93 bps) lead the Broncos attack. The Bulldogs are coming of a 1-2 outing at the CSU Bakersfield Invitation, with a sweep of Chicago State and losses to Arizona and the host Roadrunners. The rebuilding Bulldogs are led by freshman hitter Baylee Platt (3.54 kps), but are hitting just .188 as a team. Former Nevada standout Lauren Netherby-Sewell is in her first season. Hurricane Gustav disrupted the Bulldogs' season, wiping out three matches at the LSU Invitational and another at home. After sweeping Louisiana-Monroe, LaTech has dropped its last two to Jacksonville State and North Dakota State. Returning to the WAC is former Tulsa coach Matt Sonnichsen. Running a fairly young team is sophomore transfer Bianca Bin.